The weekend is here (ok...it's almost over) and I am officially on my holiday break. While I am happy to see it here, I can't believe that the past 12 months have flown by so quickly. Must have been a fun one I guess. I've been finishing up some custom cards for my sister to give out as gifts this year and it has me rarin' to go with some long overdue custom projects. That will get some time and energy of mine in the days leading up to Christmas. It's something I am very much looking forward to. I am also looking forward to diving back into a couple books. I have let my goal of reading 20 titles this year slip....badly. In fact, I haven't read a single page out of one of the many books I have on my shelf since the middle of August. For shame. Speaking of books, I've got to share this amazing gift I received the other night from a friend of mine who knows I enjoy books, sports, signatures and collecting. 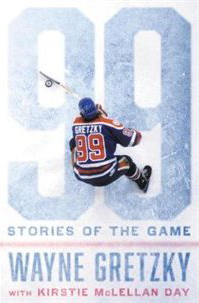 This is the new book by The Great One as he shares some of his memorable stories through his life in hockey. It's been on my radar as I used to work for the author, Kirstie McLellan Day. She owns a production company in town with her husband and I was an editor there for a good eight years. She had written her first couple books during my time there and I really couldn't get into either of them...in fact, I thought they just weren't that good. But when I saw she was doing a book on Theo Fleury, Bob Probert and then Ron MacLean I thought maybe I should take another look. But buying the book new just wasn't going to happen. I rarely do that now because I have way too many on my shelf as it is and I like to buy books at the used book sales each May here in town where the money goes to very worthy charities. 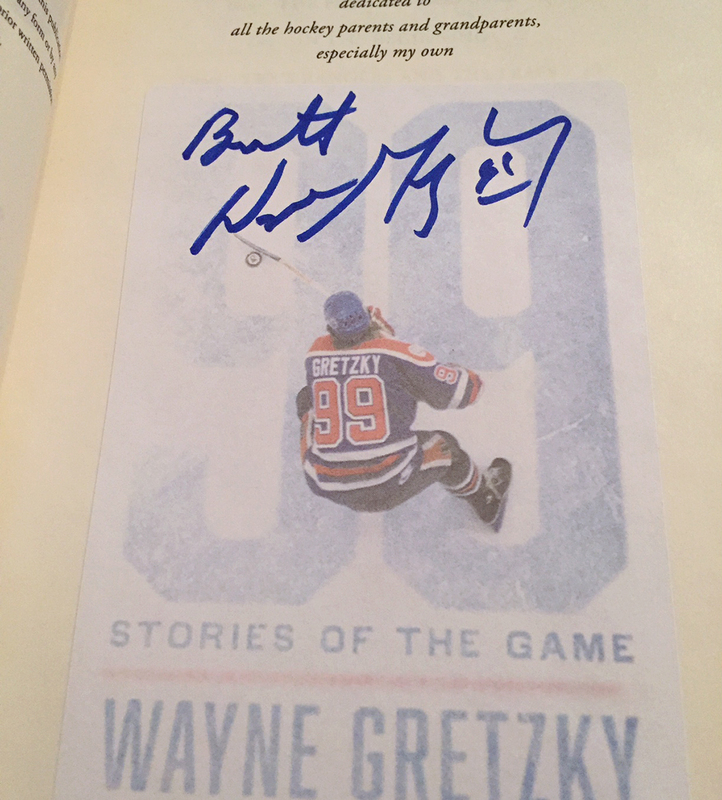 ....especially when I saw that the book was signed by Gretzky himself!!!! I would have loved to have seen my face when I opened the cover and saw the signature. I was absolutely gobsmacked - speechless. Heck, I still am and I've had a couple days to let it sink in. Yes, the signature is on a sticker that is then placed on the inside page of the book....but still. 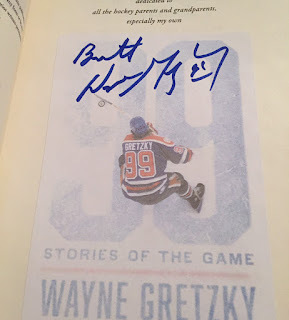 It's a genuine Gretzky auto - personalized....TO ME!!!! Seems my friend (along with his other co-workers) was asked by Kirstie if he would like a copy signed and if they would like an additional one signed for someone else. For him to think of me in that moment was super thoughtful. I've been lucky enough to discover some autographed copies of books over the years and I have been even more fortunate to receive some as gifts too. But this Gretzky auto is on a level all its own. 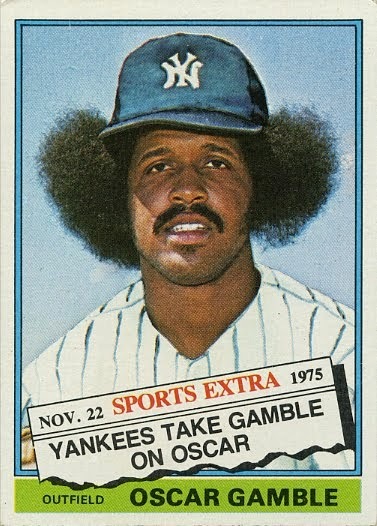 This is without question a Great One. Huge thank you Dave for the incredible gift. I will definitely have to read this book now and am looking forward to tearing it to shreds chatting about it in the new year. That is an incredible gift and an awfully sweet gesture. Good luck topping it. Happy reading. Your look was pretty priceless! 😊 Hope you enjoy it. Maybe it will kickstart your 2017 reading challenge. Get ready for Marty McSorley, then Kelly Hrudey books in the next couple of years from Kirstie. She's prolific! I hope so too. I've two on the "to read" list while I'm off work. One is by Cary Elwes on the filming of The Princess Bride (which I watched start to finish last night). Awesome. The other is the most recent (and final) book by the legend Arnold Palmer. McSorley and Hrudey eh? Could be good.